The developers of Tremont Crossing in Boston’s Roxbury neighborhood have signed a letter of intent with Westborough-based BJ’s Wholesale Club to be an anchor tenant for the 1 million-square-foot development. Dubbed “Parcel 3″ and located on seven acres at Tremont and Whittier streets, the project has been in the works for more than a decade. P-3 Partners LLC, a collaboration between Elma Lewis Partners and an affiliate of Feldco Development Corp., is planning to build about 405,000 square feet of retail space, 234,000 square feet of office space, 300 apartments, a 200-room hotel, and 37,520 square feet of cultural facilities that will primarily house a new museum for the National Center for Afro-American Artists. 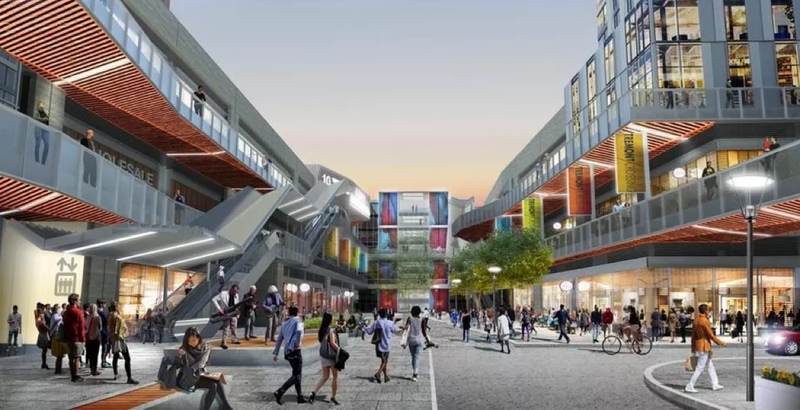 The development will also include two public plazas, and a multi-level parking garage with 1,502 spaces. The arrival of BJ’s was discussed in a community meeting on Monday. The chain would occupy a roughly 90,000-square-foot space. Despite the first good news in a long time for the project, the development team’s members still have a long way to go. A hotel flag has yet to be secured and an office tenant has eluded them. Late last year, Partners HealthCare decided to consolidate its administrative operations in Somerville, disappointing city officials who had hoped Partners would instead pick Tremont Crossing.